This new TRiONiC Walker is a quality product that will produce years of superior service. The TRiONiC uses a 3-wheel design, but employs 4 wheels to do it! 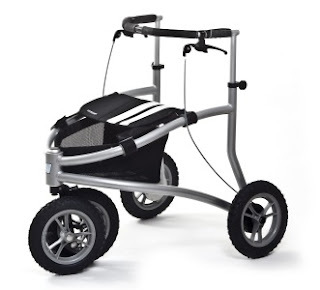 The front wheels can be set for different walking modes and surfaces and provide a suspension system that combines with TRiONiCS 12" pneumatic (air-filled) tires for a great walk through the woods, a bike trail, or around town. The over-sized frame is a lightweight 26-lbs and supports up to 330-lbs. The frame folds and wheels remove for easy transport. Seat and Carry Pouch are included and there are several seat color combinations to choose from. The TRiONiC Walker uses an adjustable climbing wheel in front. The moving link arm also provides a suspending function. On uneven ground it constantly suspends the ride. The suspension turns the outdoor walk into pure pleasure. The wheel can be dually adjusted according to environment and terrain.